FAQ - All slot machine stands are made at the warehouse. All slot machines are reconditioned and fully tested. Machines are always available for viewing or inspection prior to purchase. All shipments can be tracked via the internet. All slot machines have a limited one year warranty. We believe in fair business and will not make any claims or promises that we cannot keep. 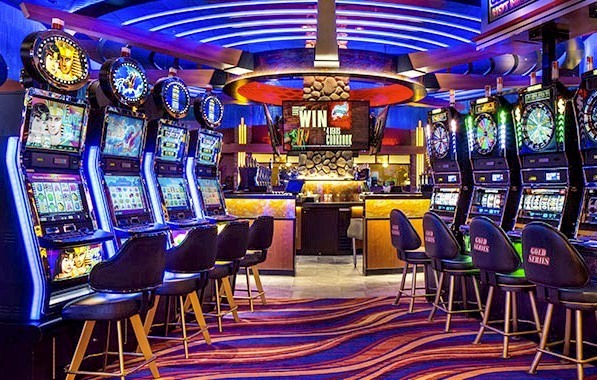 All vendors buy slot machines from brokers – all slot machines are used – all need refurbished before selling to the public – all should have warranties because they WILL need service at some point. Cars need maintenance, slot machines need maintenance. Whether it be a blown bulb or a question about the jackpot reset key, you will be making that second call to the vendor needing support and answers to your questions. Gamblers Choice will be there for your needs. The bottom line is Gamblers Choice did an outstanding job getting my order squared away. I ordered the double bucks and red white blue 25cent machines, wow they are great. The shipping was fast and they came in perfect condition. Then I called them because I couldn't figure out something on the change machine and they had the answer within 10 seconds. Very easy fix of pushing a button. I would recommend this company to anyone who wants a great outstanding slot machine. I love how it looks at night. It lights up my entertainment room. Thank you so much for providing a reasonably priced product. I couldn't find them anywhere else for the price I paid through gamblers choice. I purchased a machine from another company two years ago, the hopper jammed and I called them for assistance. Even though they advertise free 24 hr support, they told me they did not know how to fix it and to call Gamblers Choice. Mo helped me and without doubt, I will make all future purchases from Gamblers Choice because they do help people regardless. I wish I had known that before I bought from that other company. Thanks again! Received my Wild Cherry slot machine recently and couldn't be happier. The whole experience with Gamblerschoiceonline was quick and professional. Machine arrived in beautiful condition and right on time. I play every day as does my wife. I'm undoubtedly the only person I know who has a slot machine in their home. And what a crowd-pleaser at parties! I couldn't be happier with my choice to purchase my machine from you folks! Not only was the buying experience painless, the machine is wonderful and after two years of trouble free operation, I just discovered what great customer service you provide too. My machine had an issue so I called and asked for assistance. In less than five minutes a technician returned my call, walked me through the troubleshooting and had me back up and running. I will not hesitate to purchase another machine from you and will recommend you every chance I get. I ordered 2 slot machines and a stand. The stand was delivered by UPS and was cracked. Dean was so customer oriented and sent another one. I had called several companies before I made up my mind and chose Gamblers Choice hands down because of their customer service. The machine arrived on the day it was promised. The packaging was more than adequate to protect the unit. When I cleared away the packing I was surprised to see a machine that was much more than I expected, it was clean, shiny, and looked all the world like a new machine. With the enclosed instructions, and the addition of a few hundred quarters, my wife and I soon had the machine humming and spitting out quarters as if we were in the casino, The only thing missing was the scantily clad lady with the free drinks! Seriously, we are completely satisfied with our purchase, the quality, the price, delivery and the very kind young lady at support that guided me through hooking up the candle. We are considering purchasing a second machine so we can both play at the same time. Our expectations were definitely exceeded!! Thank You for a great product. Ordered machine and it arrived in perfect condition. Had a few problems getting it set up so e-mailed Gamblers Choice right away. Within 10 minutes I had a response and it was a Sunday afternoon. I called and had them walk me through the problem. Within 5 minutes the machine was running perfect. This is customer focus at its best. I would buy from them again and feel comfortable that any problem or issue will be resolved. The problem by the way was me not the machine. I recommend this company for anyone looking for the products they sell. Top notch. It was a pleasure doing business with you last Friday. I should have bought another machine as my neighbor wants one now. I need to plan another trip to the Dayton area. My wife and neighbors love the double double diamond that i purchased and wonder if you could give me the same deal on one or two more? Ordered Double Strike online, was initially disappointed when I received a call saying that model was not in stock. Took a few minutes to go over other machines, chose a Triple Red White and Blue. Very happy with that choice. Received the slot machine in less than 1 week, in great shape. Works great, support is outstanding. Friends and family love it. I have already given out all of the business cards and told them this is the place to buy. Will definitely purchase another this Christmas season. Thanks. I was very pleased to speak with someone who isn't in another country and can barely speak English. Mo was very easy to understand and made her directions clear on what i needed to do. My machine was up and running quickly. My guests were very happy playing the slot machine. I may need another one! Just wanted to say thanks to Allen in technical support for solving my 3100/3200 error messages with coin issues. Allen is dedicated to calling back right away and resolving any issue you have with your slot machine, So once again great customer service from Gamblers Choice. I definitely recommend this company to anyone that is interested in slot machines. Thanks Moe for responding to my e-mails at 1am thank you! We are very pleased with our slot machine and the service we received from your company! "Spin til you Win" is a great machine to play. Our machine came in one day early and in perfect condition. You guys are GREAT and we will buy another machine from your company soon.. We told all of our friends about your great service and prices.. Thank you again..
After much googling we purchased a Double Diamond Deluxe slot machine from Gambler's Choice Online. We were delighted when we went to pick up what looked like a brand new machine. It works flawlessly and we literally saved hundreds of dollars purchasing from them. Moe and Tom provided detailed instructions and an amazing walk-through in which we were shown every facet of our machine. We are extremely satisfied with the product knowledge and the technical expertise. It pays to purchase from a smaller customer-oriented business with lower overhead costs if you are looking for a good deal. I would recommend them to anyone. I purchased a wild cherry machine a little less than a year ago. I contacted Gamblers Choice and let them know what type of trouble I was having. They immediately told me what I needed to do. Once I received what I needed, Alan walked me through the entire process. I am so glad I purchased my machine through Gamblers Choice. Their customer service is amazing! Thanks Alan for your patience. We ordered the Double Diamond Slot Machine and it was delivered in perfect condition and worked perfectly and still is working great. We love it and the people at gamblers choice have been awesome. We can call anytime and they answer and have answered all our questions immediately. I cant wait to purchase another machine. I recommend this company to all. I am totally impressed with my purchase and the staff. I have always talked to a person, never a recording. And technical support is Great. They walk you through questions on the phone and mailed out a replacement promptly. I would buy from them again and recommend to all my friends. Thanks Moe and Tom. Ordered my machine on Sunday evening. It was shipped on Wednesday and I received it the following Tuesday. Great service! It looks brand new, hard to tell that it had previously been used in a casino. I especially like the candle on top of the machine and all of the whistles and bells. Several years ago I purchased a slot machine from a Las Vegas dealer and I was told that Nevada gaming regulations required that the candle be removed and the sound effects be disconnected. Half the fun is having a machine that acts and sounds like the slot machines in a casino. Gamblers Choice is a great company to do business with. The staff is very friendly, courteous and extremely helpful. I will be ordering another machine shortly and I urge anyone who has ever wanted to own their own slot machine to purchase it from Gamblers Choice. I bought my Red White and Blue 2 years ago and I love it. I had an error code come up the other day. I reviewed my original documents and it stated that I could call 7 days a week for customer support. 2 years after the sale they treated me with top notch service and had my machine going again in just a few minutes. No one else compares when it comes to service after the sale. This was the reason I bought from Gamblers Choice to begin with and my decision paid off 2 years later when I needed help. The people here at Gamblers Choice are very helpful. Machine was delivered the day they said and it works like a dream. What a deal. I definitely will be ordering another one real soon . I love it and all my friends do too. Only problem is who gets to play it first. Thanks a million . Thanks to all the friendly staff at Gamblers Choice. We received our "Reel'Em In - Cast for Cash" and stand in great condition and we love it! It was a pleasure dealing with everyone and what a treat to talk with people (each and every call) verses a machine, etc. Thanks a lot and you made a repeat customer out of us!! Received my Double Diamond Round Top Machine in perfect condition. I was up and running in 5 minutes. My machine was well packed and secured, and was delivered within 5 days. Thanks Mo, for your great customer service and support. I am glad I made the right choice, with Gamblers Choice Online ! I am definitely getting another machine soon ! Take care guys ! Thanks again ! We purchased the slot machine "Haywire" from Gamblers Choice. We received the machine exactly one week after we placed our order just as promised. We were very pleased how nice the machine looked. We needed some help getting the machine going mostly due to my lack of understanding on how to set it up. The customer service that we received from Moe and Alan at Gamblers Choice has been outstanding. It's the great service that we have received after the sale that really says a lot about the company. We love our machine and can't wait to see how our friends like the machine at our upcoming house warming party for our new home. I have a friend that bought a machine (5 times Pay) here locally and he paid $1,450.00 for his. He was very surprised to hear I got mine for about half what he paid for his four years ago. If we ever buy another machine we will buy it from Gamblers Choice. Gamblers Choice gave a great service...it took me 5 mins on the internet to order and pay for my machine...a day later they where on the phone arranging the delivery and a matter of days later the machine was at my door. I found them to be very very efficient !!! Highly recommended ! WOW! These are the greatest people to deal with. Highly ethical. We received our slot machine in damaged condition and they addressed the shipper and sent replacement parts immediately. I was able to reach a knowledgeable person every time I called. I will purchase from them again. Thanks for all the tech help with my machine!!! I called Gamblers Choice looking for a manual for an IGT machine but they are no longer available for sale...they talked me though the repair even tough I didn't buy it from them. You can bet I will highly recommend them to anyone I know looking for a slot machine or parts etc... Thanks again!!! I want to thank you for all your help and assistance in purchasing my machine. You were always there to answer any questions. The machine arrived when told, and in perfect condition. I would highly recommend you to anyone looking to purchase a machine online. Thank You!! Bought my wife a Triple-Diamond round-top for our 30th wedding anniversary. The thing looks brand NEW and plays like a dream. This is the first machine I have ever bought and they patiently answered all my questions . If you call with a question about the machine, you get a real HUMAN on the phone. A great organization to do business with. Mo, you are the BEST! The Machines are wonderful and play and pay great! I had a couple machines that the battery on the motherboard went dead on, and this was 1.5 years after I bought the slots. Well, I called them up and they talked me through it, no problems! One machine did need some memory work done on it. I sent in the boards and they fixed my problem for a very reasonable sum and shipped it right back and everything worked great. They DO stand behind their machines and their technical help is unmatched! I happily endorse their machines and service! Thanks! I purchased 2 triple diamond machines and received them in great shape. I had a very minor problem with closing the door properly. My phone call was returned within minutes and the problem was quickly solved by Alan. Your service is great. I will recommend your company to all my friends. I look forward to buying another machine soon. I am very happy with my multi game slot machine. They were very quick to help me fix the damage done in shipping. Customer service is excellent you can reach them anytime and the techs have even been helpful with my other machines not purchased from Gamblers Choice. Shipping is $195.00 per slot machine. Slot machine stands ship free if ordered with a slot machine. Otherwise the shipping cost for slot machine stands is $42.00 per stand. Does shipping include inside delivery? Shipping cost does not include inside delivery. Inside delivery can be arranged with the shipper directly at your own cost. What are the most common technical problems with casino slot machines? (1) Jammed bills in the bill acceptor. The bill acceptor should be cleaned every few months if used heavily. (2) Blown bulbs – each machine has 3 flourescent kitchen/bath bulbs that are readily available at any hardware store. They are easily replaced and cost @ $5.00 each. (3) Dead battery on the motherboard – a battery can be obtained from the vendor or your local hardware store and can be replaced by using a soldering iron. Or the motherboard can be shipped to the vendor for replacement. (4) Adhesive holding the reel strips together comes apart – Use a strong clear tape as a replacement. All casino slot machines will display an error message if there is a problem. Error messages are displayed on the front door when something is wrong. This is where after-purchase support is important. Be sure the vendor you select has the in-house capability to know what the error message means and how to fix it quickly. Are all casino style slot machines used? Yes. This is true for all vendors. New slot machines are sold to casinos only. Most slot machines on the market now are 5-10 years old. But just like anything, if you take care of them they will last a very long time as they were originally built to endure many years of play in a casino. What questions do I ask before purchasing a slot machine? (1) Is the slot machine refurbished in-house? (2) Is the company available for troubleshooting 24 hours? (3) Does the machine have a bill acceptor? (4) Ask for references of other satisfied customers. (5) Most importantly…..do not believe everything you read or hear. Why do the prices vary from company to company? Some companies place hidden costs in ‘Shipping and Handling’ or the machine has some features that have been removed, such as the bill acceptor. Look for a clear defined price before purchasing. How to decide which company to purchase from? The key to purchasing a slot machine is being sure that support is provided throughout the life of the machine, which can be up to 20 years. A good test is to call a company requesting tech support and see if they are willing to take care of you. Some companies do not support their products once they have your money. How does Gamblers Choice differ from the rest? Well there are other professional slot machine companies that provide quality products and services, we are not the only one. Our prices tend to be lower though because we do not have the added cost of a large showroom and we buy directly from a broker. We also have NO hidden charges. We believe in customer support and answering any questions. Our technicians are trained to know slot machines inside and out. Ideally we want to make sure that you are as happy months after your purchase as you felt the first day with your new machine. Most slot machines have to be ordered online because it is illegal to sell slot machines in most states. Many states have laws that the machine must be older than 25 years to be able to own one. We do not recommend buying any slot machine older than 10 years old because it is nearly impossible to get parts or support for older machines. If the machines are strictly mechanical then they are worth quite a bit and should not be played regularly. Mechanical machines are considered antiques however electronic machines older than 10 years are garbage if broken.